Every human person is created in the image and likeness of God. 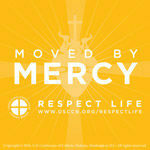 With Christ's love, the Diocese of Gaylord's Family Life and Respect Life Office is here to serve you. We offer a variety of opportunities for people to grow closer in relationship to Christ through marriage preparation classes and retreats, family life support and enrichment, respect life information and activities, opportunities to learn Natural Family Planning, education in St. John Paul II's Theology of the Body, and continued efforts to help all grow in awareness of the beauty and dignity of every human person. Be a Witness for Life! Every January, pro-lifers across the Diocese of Gaylord take a public stance against abortion. Parishioners from various parishes hold either local marches or prayer services. To find opportunities for you to get involved and help protect life, contact Marie Hahnenberg at mhahnenberg@dioceseofgaylord.org. Or click here to view local pro-life events. Congratulations! We hope to answer any questions as you begin your preparation. Click on the "Matrimony Preparation" tab on the left to help guide you in this exciting time! The U.S. Bishops Annual Novena, 9 Days for Life takes place Monday, January 14 - Tuesday, January 22, 2019. Pray for the respect and protection of all human life (especially those in the womb). See the USCCB Website for more information! Observed since 1972, October is Respect Life Month. Each of us is a Masterpiece of God's Creation. Let us all pray for peace, from womb to tomb here in the Diocese of Gaylord. To help educate the people in your parish, visit the USCCB's website for additional resources or contact the Family Life and Respect Life Office at 989-732-5147. Ask for Marie Hahnenberg.